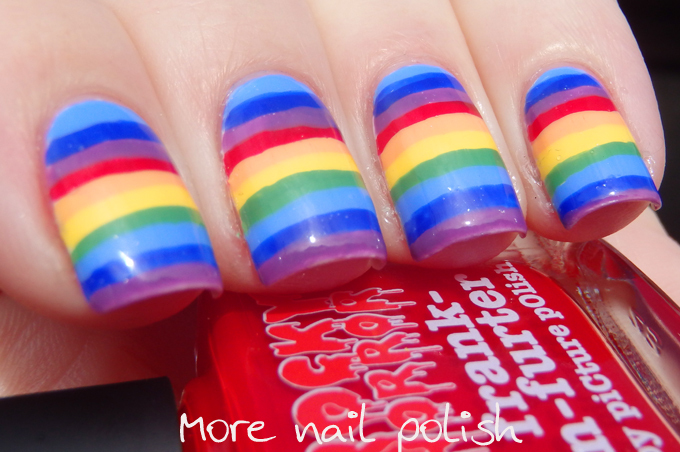 Looking through my draft folder of images it turns out I've been on serious rainbow kick! 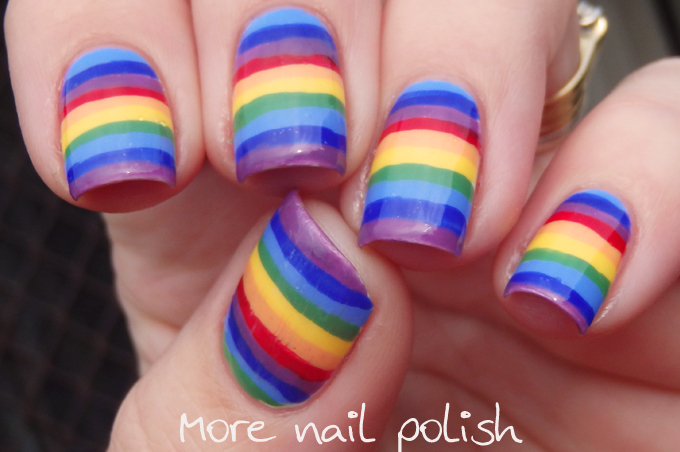 I've always said that rainbow is my favourite colour, so it's no surprise really. 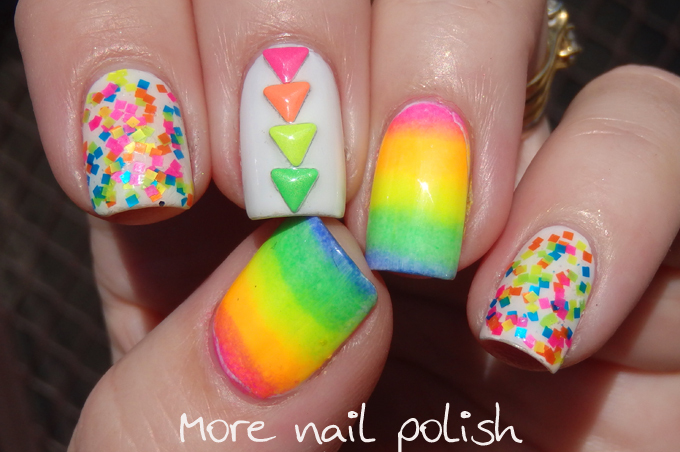 I actually have enough rainbow manis (if I include the neon rainbow gradient from yesterday) to have an entire week of rainbow designs. 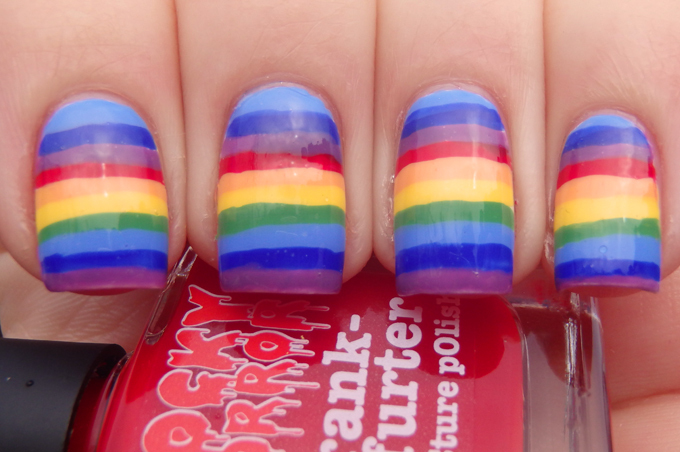 So my second mani in my week long rainbow extravaganza is this horizontal free hand striped mani. I find doing horizontal stripes so hard to do. 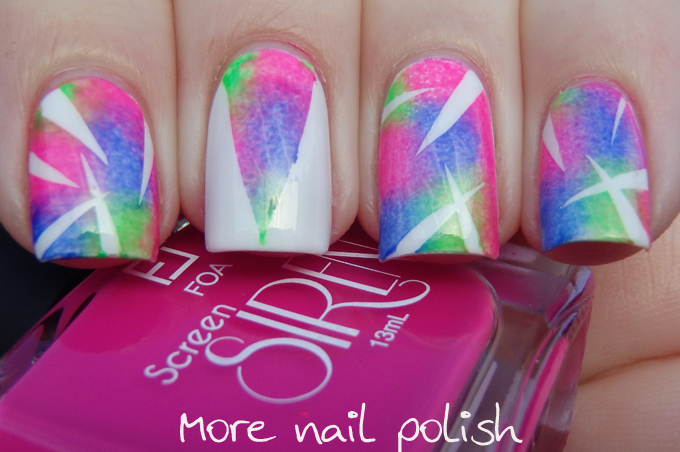 Vertical ones are easy, but I really struggle to get the lines even right to the edges of my nails. I used Picture Polish Swagger, Frank-n-further and Totes, Ulta3 Blue Marlin, Palette Play and Kiwi Kaos and OPI I can't cope-acabana. 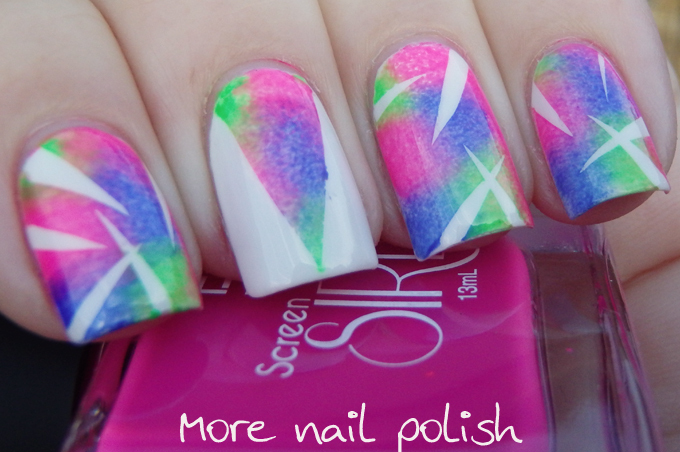 Just like last week, when Dance Legend Rio #1 inspired me to create crazy neon nails, Rio #3 has made me do them again. 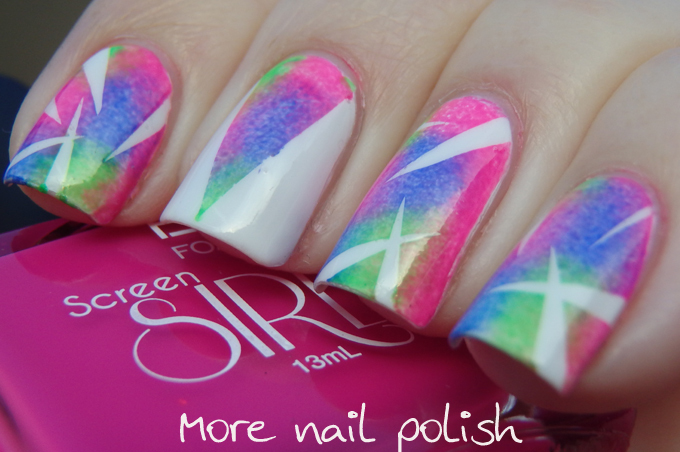 Rio #3 contains neon square glitters in pink, orange, yellow, green and blue. I sponged to two layers of Rio #3 to get a really dense finish. 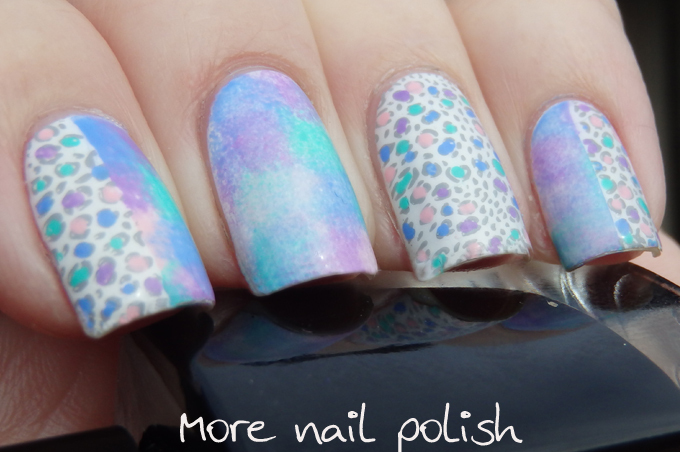 Its such a fun polish and I love that it's only square glitters. 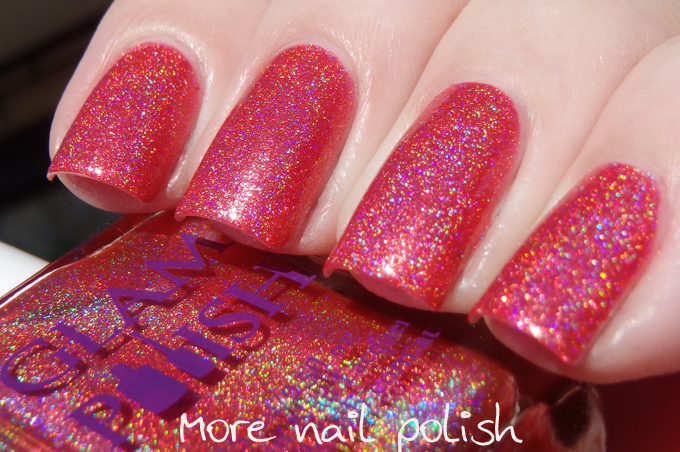 I want to try this glitter in a jelly sandwich with OPI Don't touch my tutu, it think it would look awesome. 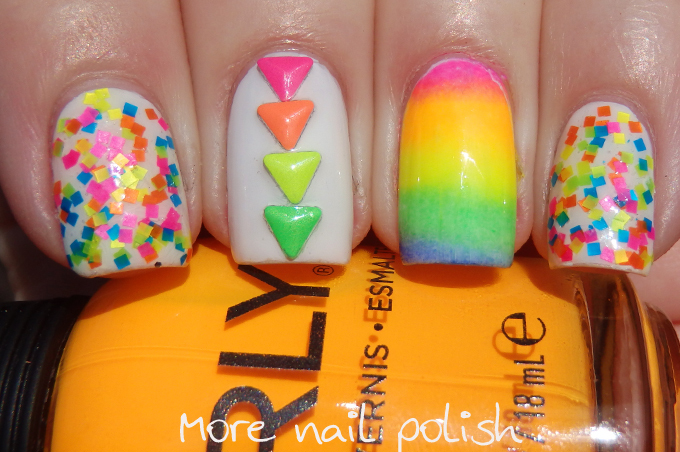 I created a neon gradient on my ring and thumb fingers using Orly Neon Heat and Tropical Pop, Picture Polish Crazy and Lime lite and Ulta3 Blue Marlin. 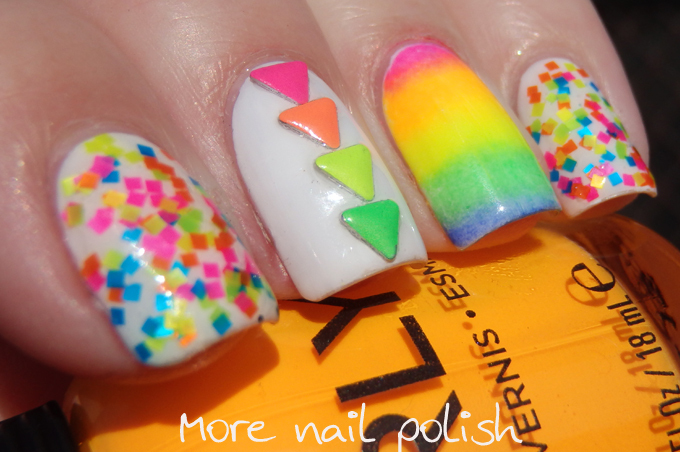 I used some neon triangle studs that were gifted to me on a white base down the middle of my middle finger. 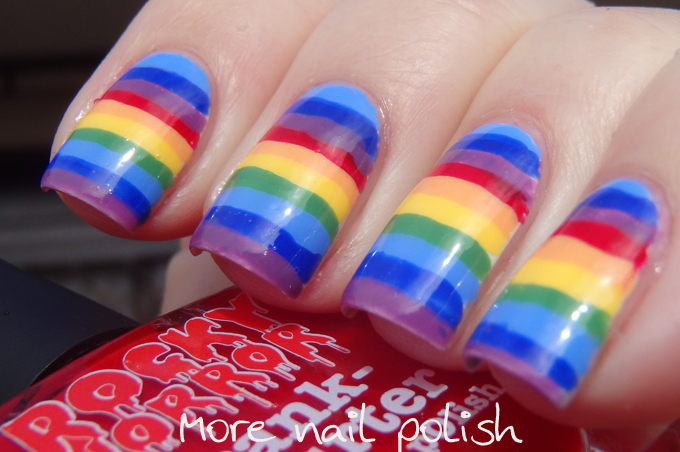 Had my nails been long enough I would have been able to fit the last blue triangle on too. 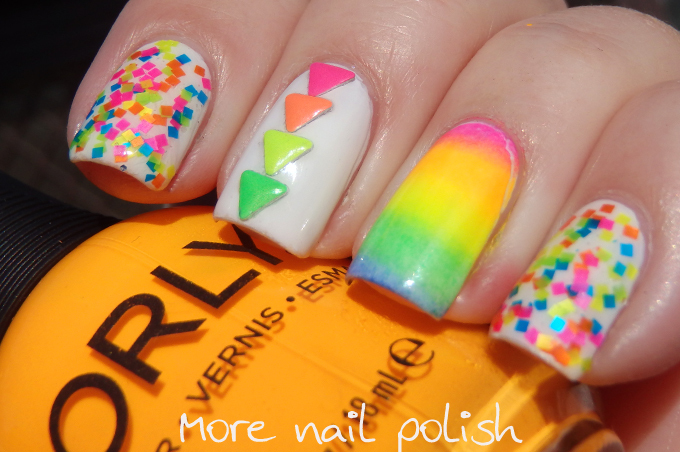 I really love those Orly neon shades, not only are they really bright but you don't actually have to layer them over white because they are really well pigmented. 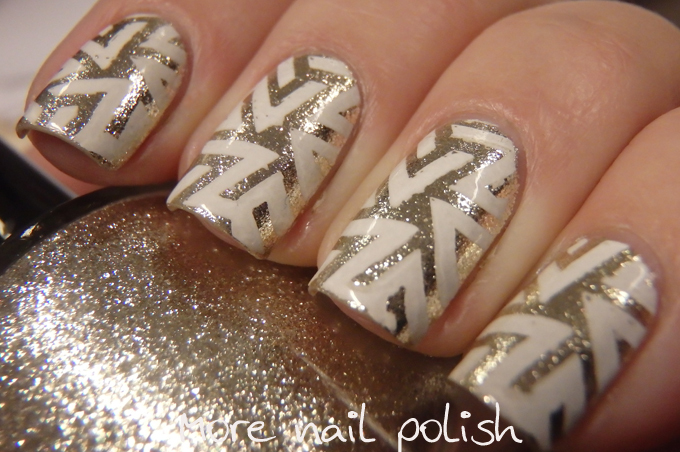 This mani combines both the sponging technique and a tape mani. 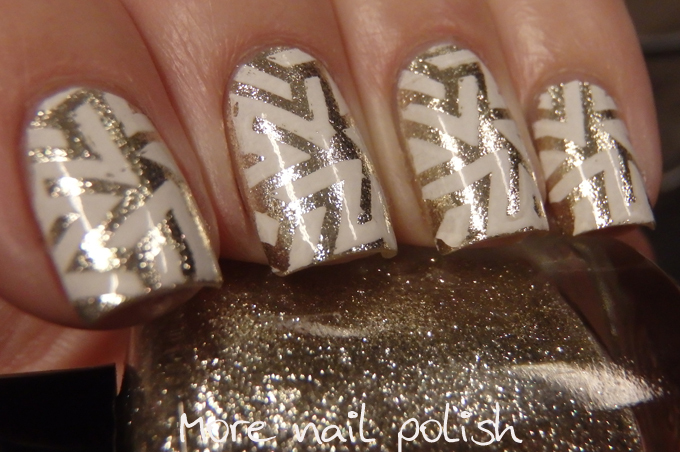 I absolutely adore this look which was inspired by Lacquer Style. 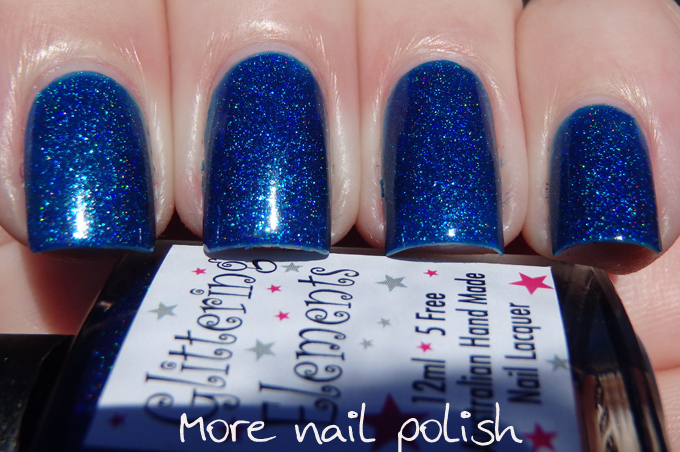 The three colours I used for this mani were Face of Australia Diamonds are a girls best friend and Ulta3 Blue Marlin and Mojito. 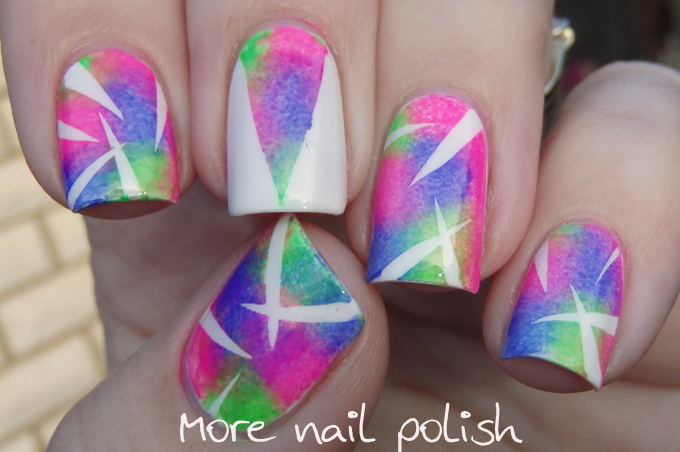 These colours were sponged onto a white base that had various section taped off to create white shards. I remembered to record this one was I was painting it, so you get a quick 15 second insta-tutorial too. 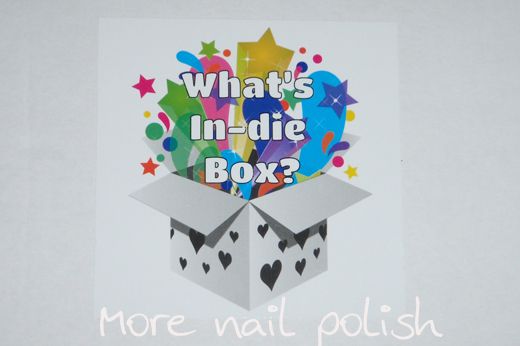 This June, Australia's first and original indie polish box - What's Indie box? - celebrated it's one year anniversary. With news that the box was going to be an all holograoghic box, I just couldn't help myself, and I made sure I put an order in before the end on month deadline. 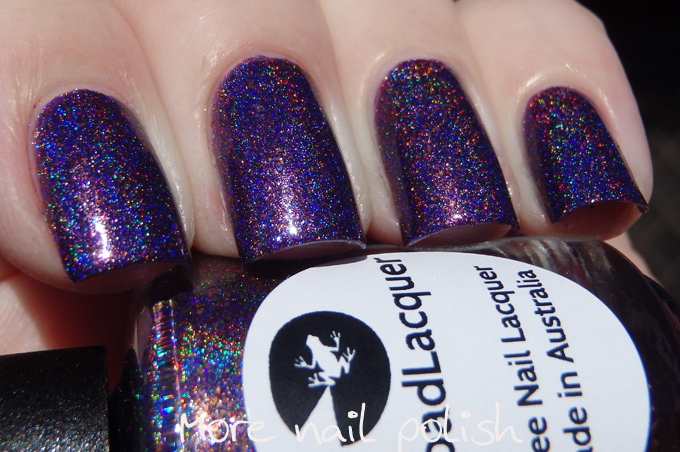 I thought, sure I could easily mix up a range of holo colours myself, but I also wanted to help celebrate our Aussie indies, especially because the majority of the brands all got started because of contacts I made through my blog with the Australian supplier of for nail polish making supplies a few years ago. Each month the list of participating Aussie indie brands slightly changes. For the one year anniversary box it was going to include polishes from Peita's Polish, Glittering Elements, Glam Polish, Powder Perfect and Lilypad Lacquer. I have to say that I really love the idea of the polish surprise. 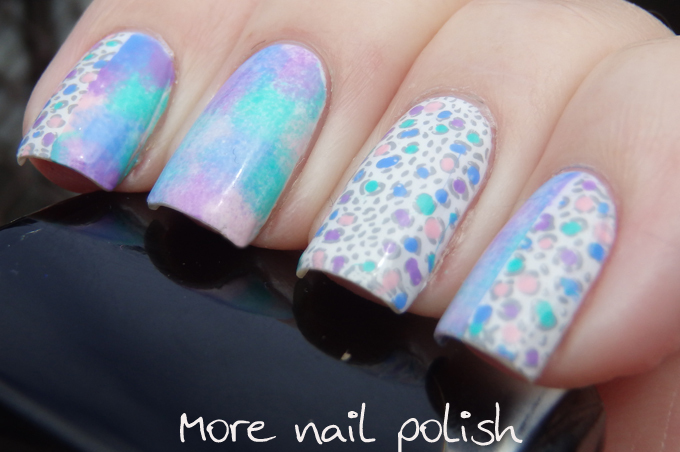 Each month in the lead up to the next months box, the What's In-die Box facebook and instagram account provide details of the theme and colour boards to show what each polish is inspired by. 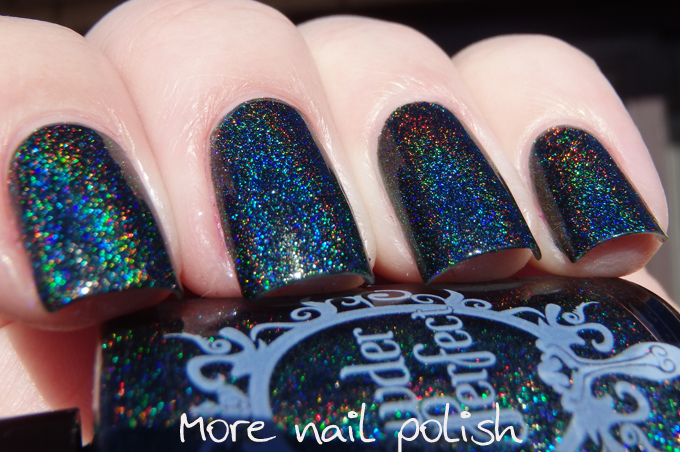 For me, this provides just enough detail to know if I want to purchase the box because I can get a feel for the polish colours that should be included. I also love that it is not a subscription box and that you can choose month by month if you want to purchase it. Let's have a look at the polishes in the box. 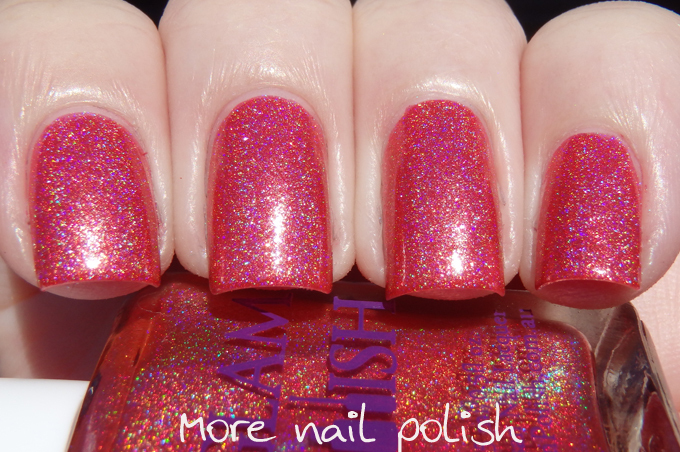 Glam Polish - Don't make me blush - A saturated coral pink holographic polish with gold and pink glass flecks. This one is just so beautiful in real life. I read lots of girls raving about this one when they opened their boxes. 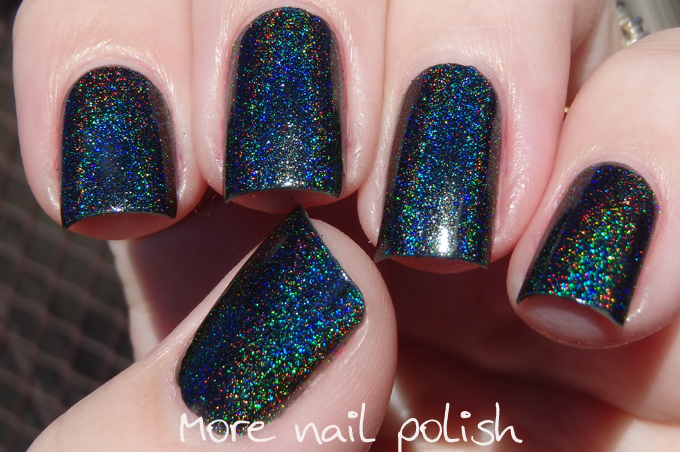 The glassflecks in the base make this more than just a regular holo polish, this one looks awesome in low light too. This was two easy coats. 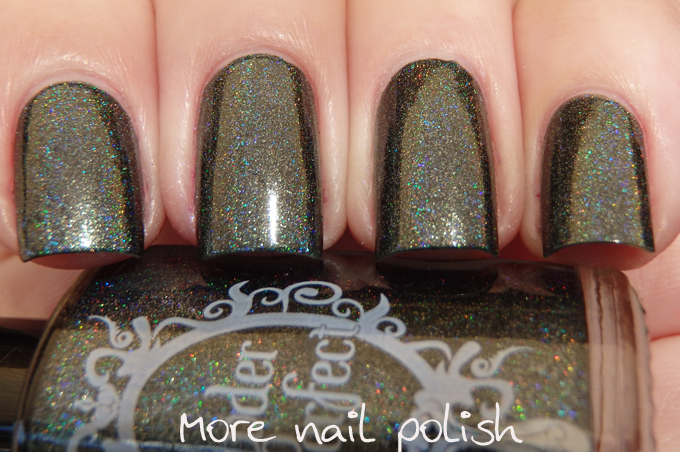 Powder Perfect - Party in the Park - a dark blackened green holographic polish. 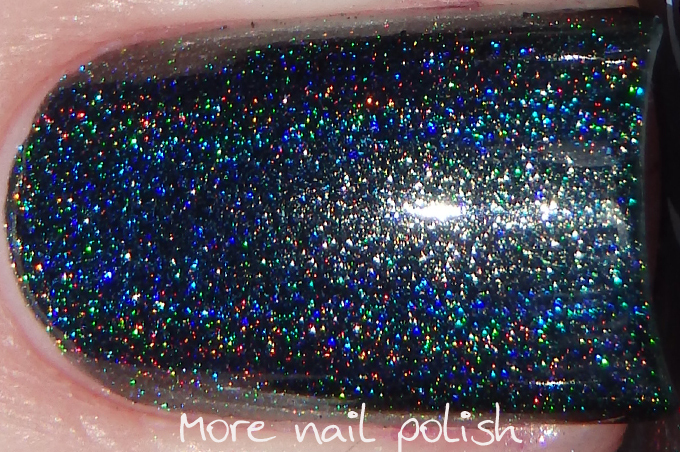 There is also some other pigment in the base, wither it's glass flecks or something else I'm not sure, but it means this polish is still interesting in low light too. 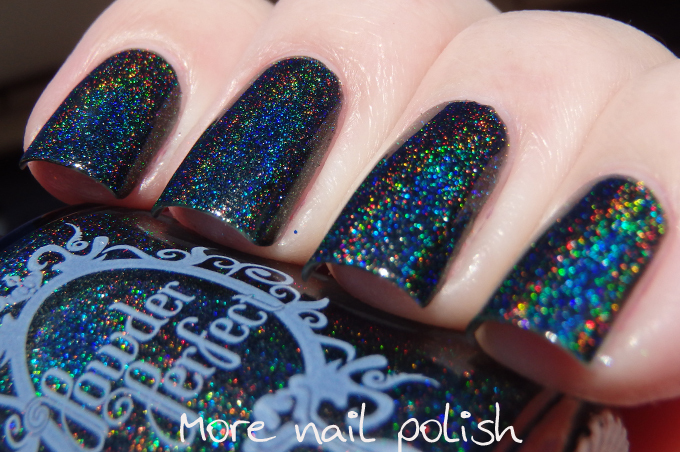 This is two smooth and perfect coats and the holo flame was nice and strong, probably the strongest of the five polishes in the box. 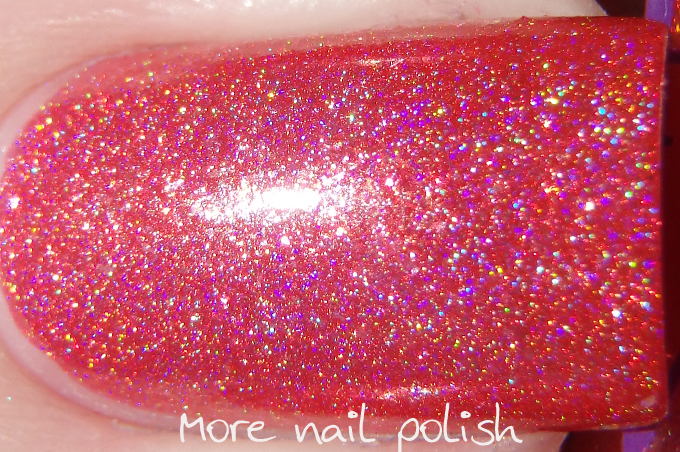 Peita's Polish - Pink Blitz - a bright medium toned pink holographic. 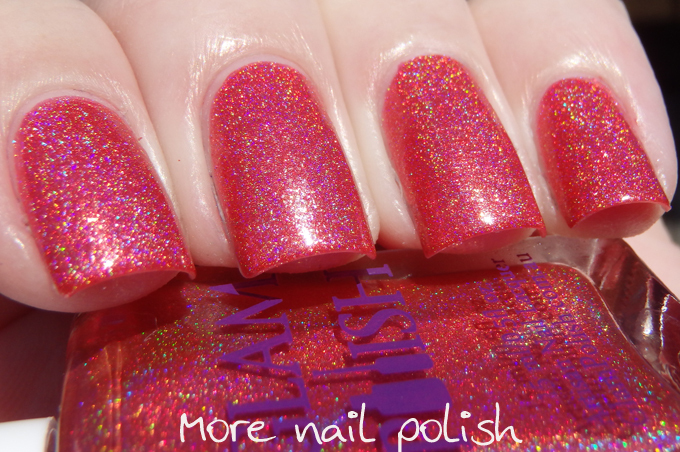 The holo flame in this one was probably the weakest in the collection, but the bright and saturated pink shade still makes this a gorgeous polish. Two coats with top coat shown here. 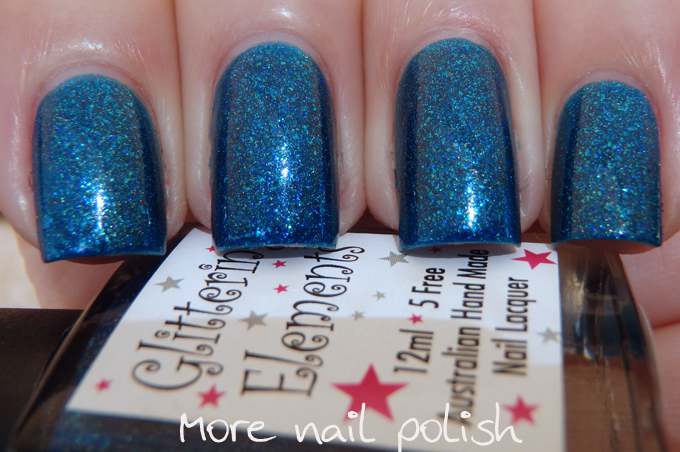 Glittering Elements - Queen of the mermaids - a bright blue holographic jelly polish with aqua blue glass flecks. 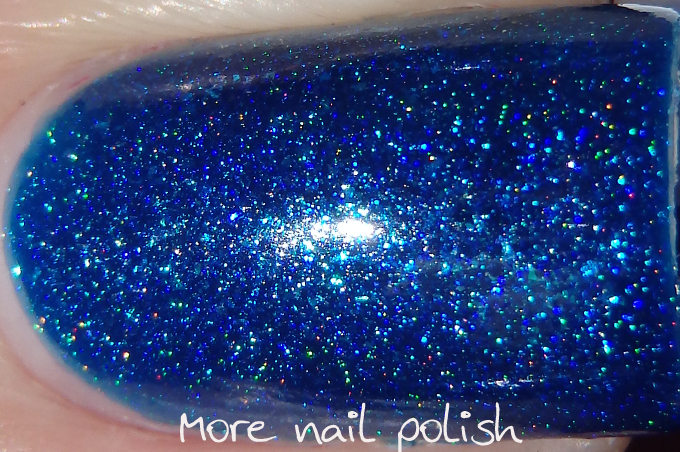 In direct sun this looks very royal blue, but in lower light the polish leans more aqua. 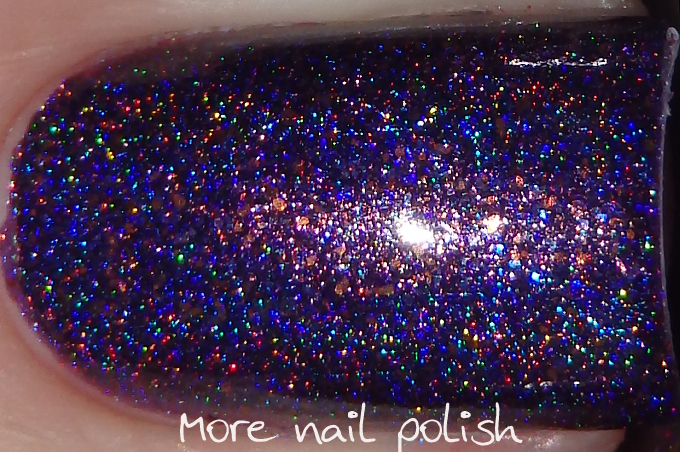 I love the glass flecks in this polish too, as it makes the polish complex and interesting in low light. Two coats here with top coat. 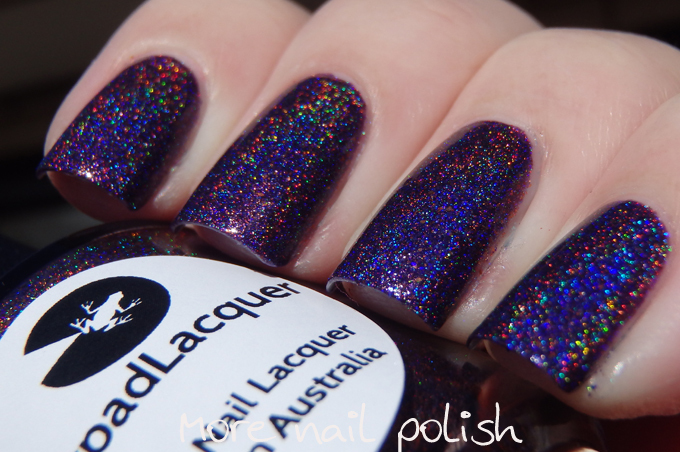 Lilypad Lacquer - Violet Blaze - a deep, rich and regal purple holographic with red glass flecks. 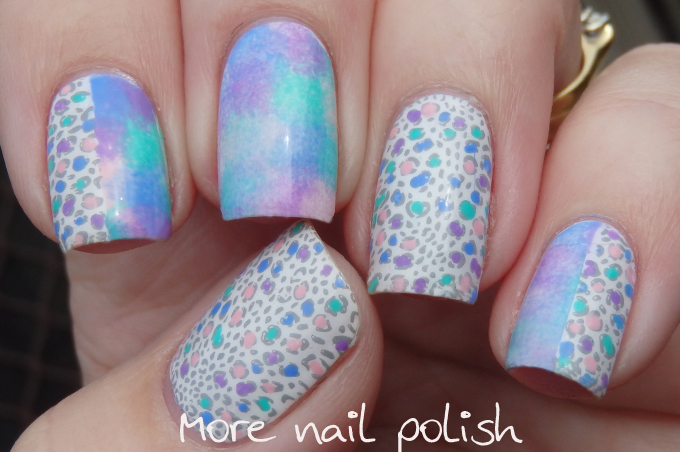 I'm loving what all the girls have done with these mixes of holographic and glass flecks. 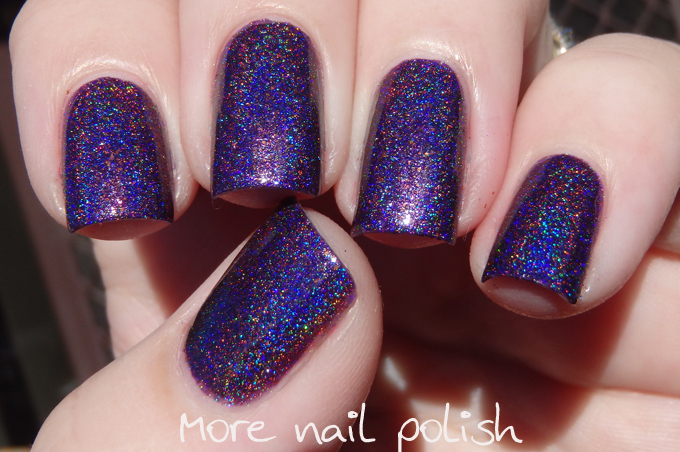 This one looks really purple in the sun where you see the blue part of the holo flame standing out, but indoors the red glass flecks make it look much warmer toned. This is two coats plus top coat. 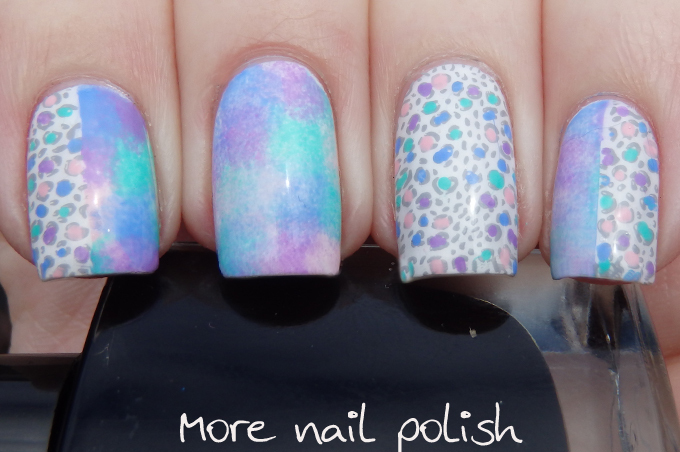 I'm really thrilled with the polishes in this months box. 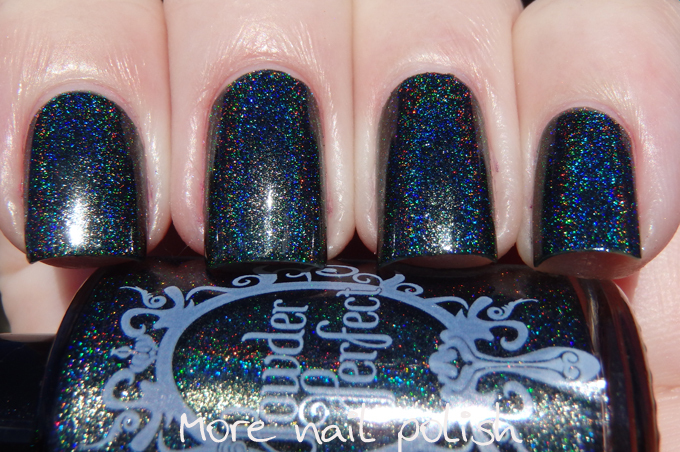 I think the girls created some beautiful and unique holo polish for the box's one year anniversary. I'd be hard pressed to pick a favourite as there are four that I really love. Orders for next months What's Indie Box close at the end of the month and can be made through the Pieta's Polish shop. International shipping is available. Who else got the one year anniversary box, and which was your favourite polish?